Photo Credit: Luke Carter, 11alive. 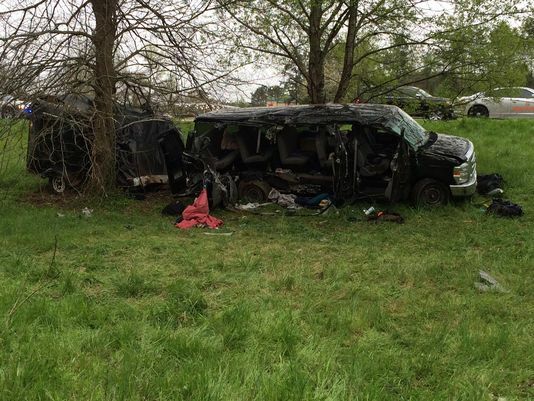 Every metal fan should know about the tragedy that occurred on Monday, April 6th 2015. While driving on I-85, the bands Wormreich and Khaotika crashed their shared van into a tree. Unfortunately, three did not make it: Nicholas Crisostomo of Khaotika, and Ian McKinney and Paul Truesdell of Wormreich. Khaotika vocalist Lariyah Hayes suffered injuries, but is expected to make a full recovery. These bands were currently on the Reich ov Khaos tour. When they crashed they were driving from Spartanburg, South Carolina to Atlanta, Georgia. Even though this was only a two-and-a-half hour drive, the driver of the van reportedly fell asleep behind the wheel. As with several deaths, this could have been prevented. It is not healthy to look in the past, unfortunately these musicians have left us and nothing can be done to bring them back. But anyone in the music industry is familiar with the touring lifestyles musicians have to endure in order to bring their live performance to their vast amount of fans. We can look at the future, and see what we can do to make the touring life much more comfortable for musicians. A precaution could be to ensure the van used is new and regularly maintained. Purchasing a new van through a leasing company may help to make it more affordable. According to Scott Smith of Georgia State Patrol, the driver fell asleep at the wheel. This caused the vehicle to swerve, crashing into a tree on the passenger’s side. Most of those in the music industry shouldn’t be surprised that falling asleep behind the wheel was the cause. For those who are familiar with a typical band’s touring schedule – whether you tour or not – know that right after a band plays, they have to wait until the show is over to load all their gear, get paid, etc. and then have to rush to the next venue. These drives are usually several hours long, so the band doesn’t even have enough time to spend the night at a hotel. With this tour in particular, this accident has proven to take a toll on the band. These bands had been playing every night for several consecutive days. Even though this last trip they took was about two-and-a-half hours long, they drove to Spartanburg from St. Louis, Missouri the day right before the accident. This particular drive is over nine hours, and they had to reach Spartanburg the next day. As fans and friends have been reaching out, their words are touching but at the same time adamant for bands to tour with caution. One fan in particular stated that when bands drive with severe lack of sleep, they are “legally drunk.” Under these circumstances, not only are bands putting themselves in danger but also putting others in that same danger. This obviously isn’t the only van accident to occur. Just last month, Within the Ruins flipped their van in Pennsylvania. Even though they did total their van and gear, no one was hurt – and they continued to tour. In 2012, The Acacia Strain got in a van accident. No one was hurt in the accident, but it was serious enough to where they had to drop-off the tour they were on at the time. It was not stated why the accident occurred or the cause of the accident for both of these scenarios. While there is nothing that shows why the vans crashed, I’m thinking it’s a similar reason to why Khaotika and Wormreich got in an accident. Accidents do happen all the time though, no matter how careful a driver you are. So if you’ve been in an accident recently then it might be a good idea to get yourself a lawyer, particularly if you’ve been hurt in the accident. If you are thinking of a getting a lawyer but are unsure about who to use then you could always check out someone like this Rock Hill personal injury lawyer to help you with your lawsuit. If you ever cause in an accident, you can also make sure that you are covered with van insurance in case you get into an accident, as it can help you with any costs of repairs for your vehicle or any injuries you may have sustained. I’ll be honest; I’m not a touring musician. Hell, I never even booked a tour in my life. I’m simply just a journalist. But from my experience continually doing press at shows, I see the toll “tour life” takes on countless bands: whether it be my older brother in the band Dark Sermon, my close friends in bands, or the artists I interview. No matter your experience, no matter your age, no matter your current state of health, the pressures of touring have a powerful effect on everyone. Being a pretty active touring band ourselves, night driving is a very risky but necessary trouble we — along with hundreds of other bands — must do. It can be very stressful, having to drive a good sixteen-plus hours to a show, but it is something that becomes a regular for almost every tour nowadays. Having to load up with caffeine beverages, late night snacks filled with sugars and fats, preparing the long term nostalgic tunes, even whipping out a few push-ups or jumping jacks to get the blood-flow going, are just a small number of little rituals many of us do in order to get physically and mentally prepared for the challenge ahead. Too many instances have taken place where a co-pilot has fallen asleep and the driver accidentally closes their eyes for too long at the wheel, or close calls veering out of the way of a crossing deer or moose hidden in the darkness. Usually the first couple hours of a night drive are fairly normal, but if you do not take care to be well prepared the following hours can be very strenuous on the eyes and the mind. Night drives are quite nerve-racking and if not taken lightly can be very dangerous. A cool trick I do, one that gets me in a slightly uncomfortable situation is to drink LOTS of fluids, like coffee, water, energy drinks, juice, etc. I must stop somewhere after three hours to use the bathroom in which I use to my fullest for helping me stay awake; like more push-ups, change clothes, washing your hands and face, buy more snacks. If you’re up all day then play and then one of you has to drive, it’s hard. Best to get a nap in before you play if you’re driving. Falling asleep behind the wheel happens a lot. I’ve never fallen asleep [behind the wheel] but others in the band have; best thing is to have a driver. No matter how defensively you drive, the fact remains that most bands travel in twelve or fifteen passenger vans. These vehicles are very well known for their tendency to flip. With the added weight of gear, personnel, and in some cases a trailer we all willingly overload these vehicles that in all intents and purposes were designed for short, low speed trips; think church vans, airport services, etc. At all costs, do not go above 60 miles per hour; 50-55 if you are pulling a trailer. No show is worth life and limb. Yes, it will take longer to arrive at your destination. But consider that once your van is loaded and moving, stopping it is not as easy as stopping your four-door Accord. This goes double if you are not hauling a trailer. Just think of what will happen to all that gear behind you if you have to stop short or god forbid hit someone from behind and come to a stop instantly — it will all fly towards the back of your heads at whatever speed you were moving at, pretty much turning you all into fresh ground beef. I’ve heard a variety of different responses from my friends. While talking about this subject in-depth with my friends, I noticed a pattern: most touring musicians know exactly what the issues of touring are and how they can affect them in the long-run, especially since most of these problems can be prevented. For obvious reasons, my friends have their identities protected. But they said similar attributes as far as the struggles of touring, which tells me this is a constant issue that threatens the lives of the driver and the band. Fortunately, a lot of bands seem to take the issue of exhaustion seriously. My friend who I first interviewed obviously has a way that he handles the situation of driving at night while tired, especially by making frequent yet short stops. My other friend mentioned something that just about every band loves having: a driver. Unfortunately, not every band can afford to hire a driver; most bands have to stick to relying on themselves to get from venue-to-venue. Even when bands are more prepared for the tolls of touring, there are still situations out of our grasp when driving. An example of this is the story of Cliff Burton’s passing. The bus carrying Metallica during a European tour lost control and crashed into a block of ice. Obviously, Metallica reached the peak of their career during this time so they had a bus driver while the rest of the band slept. This story shows how unpredictable touring is, and also reminds us of the tragedies that can occur. I feel when speaking of the issues behind touring, most want to point fingers at booking agents who book tours. The fact is no one in particular is at fault. A good booking agent will first create a rough routing schedule that has both the dates and length of drives, along with any days off. (Source for following information: Pete Olen, Promoter in Tampa and Orlando) The booking agents then run this rough schedule to the promoters based in all of these cities, and usually give a few dates as to when will work best for the venue. The promoter gets back to the agent as to when is best for the venue to book the show, and then the agent puts that date down as a permanent (or possibly permanent) date. During this time, that routing schedule can go through several revisions and may end up being completely different than what was planned. Experienced booking agents know of this possibility, and usually have their own ways of handling this kind of situation. I spoke with Jeff Schenck, who is the founder of Donarus Management and PR. When booking bands, he usually plans to limit drives to two hours after a show – never exceeds seven or eight hours between shows. This is obviously ideal; however, there can be situations where the drives are longer or can only be done overnight. He also gave me great information on tour safety that he has learned while working in the business: another passenger is always awake with the driver, and if the drives are done throughout the night then all persons awake take turns driving every two hours. Each tour is also always assigned a tour manager to coordinate schedules and take some pressure off of the bands. Other rules such as no drinking and driving (which I’m sure all bands follow) are also used to ensure safety, but also making sure all drivers are hydrated. Since the tours that Schenck books have shorter drives, he plans for the band to play every night. Last minute show cancellations are common, and usually those become days off. Another show is booked if it’s close to where they were originally supposed to play. Scheck also reminded me that booking agents take into consideration stops to go to the bathroom, to eat, to get gas, traffic and even time zone changes – while these may add hours up to original driving time, they contribute to the fact that bands will reach the venue at the required time to load their equipment. So why did I go in-depth on the multiple artist statements and the hefty explanation of the business behind booking tours? I’m proving that there are things outside of the control of the band, agent manager and/or promoter. The last thing I want to do is try to put blame on someone or something; rather, I want to document ways that personnel involved in booking tours or touring have ways in which they avoid a potential terrible situation, and these methods have obviously worked for these people. My ultimate goal for this article is to promote safe and effective touring decisions; whether they be for current touring bands who never thought of these ideas, for prospective touring bands who want some education, for booking agents and promoters who are new to the business, and especially for the fans who want answers to their questions. Like everyone else, I found out about the tragedy this past Monday. I said goodbye to my brother that evening. He left the following morning to support Sworn Enemy on an east-to-midwest U.S. tour, and then will leave right after to support Aborted on a full U.S. tour. I won’t be seeing my brother again until June. While I’m not a pessimist, I’ll be lying if I said the recent tragedy made me think about the safety of Dark Sermon. Like I mentioned, I’m someone who has never been on tour. Yet, I have a loved family member who tours constantly. I have countless friends who are full-time touring musicians. People who mean a lot to me are constantly on the road, and I care about their safety. I just hope my concern can be spread to other friends, family, and the fans. My condolences go out to the family and friends of Ian McKinney, Nicholas Crisostomo, and Paul Truesdell. I feel for fans of Wormreich and Khaotika. I just hope this situation will eventually get easier for those affected. I never knew these men, but it’s always sad to lose a member of the metal family. I’m hoping this article could possibly prevent more deaths in the future. Like I mentioned before, instead of looking to the past let’s try and make the future a little bit better for touring musicians.